Welcome to the SMSReader page! Read your own Sega cartridges and copy the ROM images onto your hard drive, so you can use them in emulators such as Meka. Write ROM images onto specially modified cartridges with battery backed RAM, so you can use them on the real Master System. 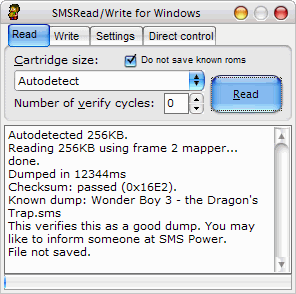 Read and write your saved games from cartridges like Phantasy Star, which have battery backed RAM for save positions. 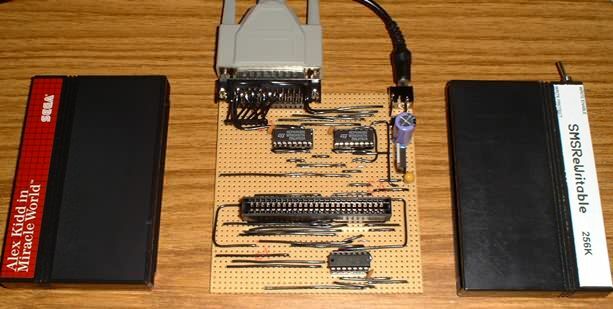 SMSReader has been designed to be simple to construct - even if you've never soldered before - and even easier to use. The software supports checksum and error checking to ensure that the ROMs you read are exact copies of the original cartridges. Additionally, ROM images you download can be patched with correct header information before writing, to make sure that they will work on your SMS. Maxim's SMSRead/Write for Windows software added. Miscellaneous minor changes. Also, Guide To Responsible Dumping added. Troubleshooting section updated with modification for reducing noise and improving reliability. A few minor corrections here and there. Rewritable page updated again. 256K instructions added, 32K and 256K cartridges given separate pages. Rewritable cartridge page updated with detailed 32K procedure. This information is provided "as is"! This project should be regarded as being in a perpetual "beta" stage, and I accept no responsibility for (a) it not working, or (b) any damage or injury which results from your attempting to build the SMSReader.